360 Degree Geisler, Seiser Alm, Rosengarten – Every day offers a great panorama. Scenic and riding highlights define this tour. 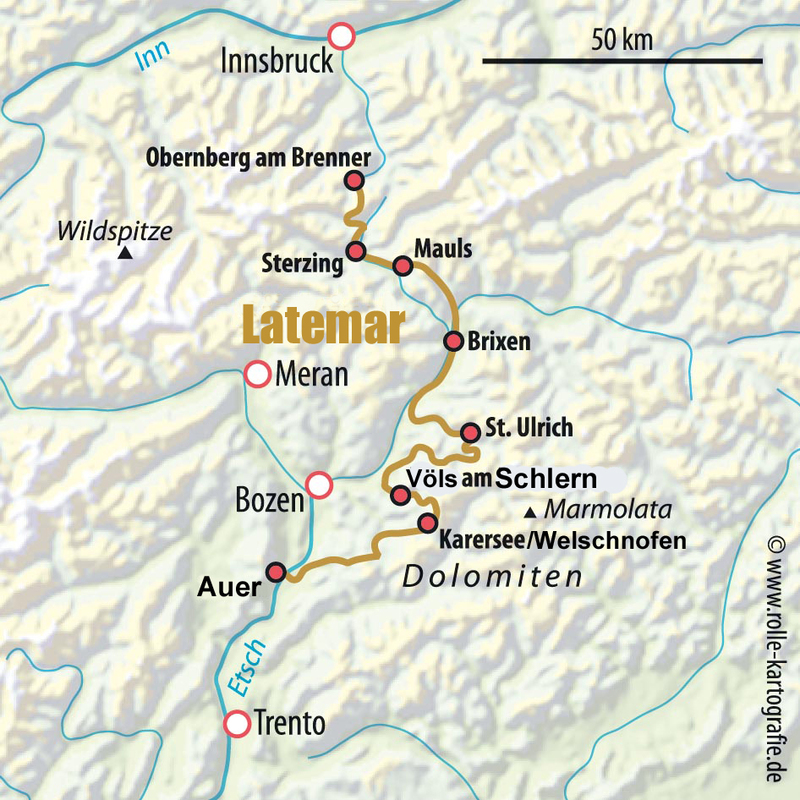 Transalp Latemar is the even more challenging version of our tour Transalp South Tyrol. We will stay at the same places for the night, but we will have to manage more meters of climbing and we will not miss any trail. The route is demanding but not extreme. Beautiful hotels and the spectacular mountain scenery of the Dolomites belong to this tour. Only for trained mountain bikers! The tour starts with a demanding climb including a passage on which we have to push the bikes. We will pass lake Obernberg and reach the Portjoch. But efforts are rewarded by the view from the Brenner border ridge as well as the legendary trail into the Eisacktal. A wonderfull view of the imposing Tribulaun is offered. We'll stay in a romantic hotel, enjoying the best cuisine. In the morning, the 2000 meter high Valler Jöchl awaits its conquerors. Once we've reached the top, we'll have a glorious view of all the peaks of the Dolomites and we’ll start into a never-ending downhill trail. We will go down for nearly 1500 meters of elevation gain into the Puster valley. We'll stay overnight in a 4-star hotel located in the historic old town of Brixen. The day starts with a little climb of 500 meters elevation gain. Afterwards the cable car brings us up to 2000-meter high peak. The view is breathtaking. On different paths we’ll reach St. Magdalena. A wonderful view of the Geisler group is offered. The well-known climb through the nature park includes a passage on which we have to push the bikes. But efforts are rewarded by the panorama. We’ll ride down into the Gardena valley and stay the night in a solid 3-star hotel with sauna. The cable car takes us right up to a height of 2000 meter. Here we’ll drive on a panorama trails on the highest alpine pasture, the Seiseralm, in all of Europe. The area offers nice trails which leads us to the Tiers valley. We'll stay in a SPA hotel. The massif of the Rosengarten group lies in front of us and we get close to the white rocks. Overnight in a sports hotel with all the comforts and a view. The final section around Obereggen and the Trudner Horn offers a great range of roads. From the Cisloner Alm we’ll go down for nearly 1000 meters of altitude difference. The wine-growing town of Tramin is our goal. We'll enjoy a multi- course farewell dinner. After breakfast, the bikes are loaded onto the bus. Return trip by bus back to Obernberg. Upon arrival, everyone travels home individually. Andi Juen, ALPS bike guide for the Transalp Engadin, Transalp South Tyrol and for TRAILCamp Alicante. Arrival: Arrival by car or by train to Obernberg am Brenner/Austria. Included in the price: Guided tour with 7 overnight stays and half board (breakfast buffet, multi-course dinner menus) in good 3- or 4-star hotels in a double room, often with wellness areas. Luggage transport, lift and cable car tickets, return transfer in a comfortable bus.